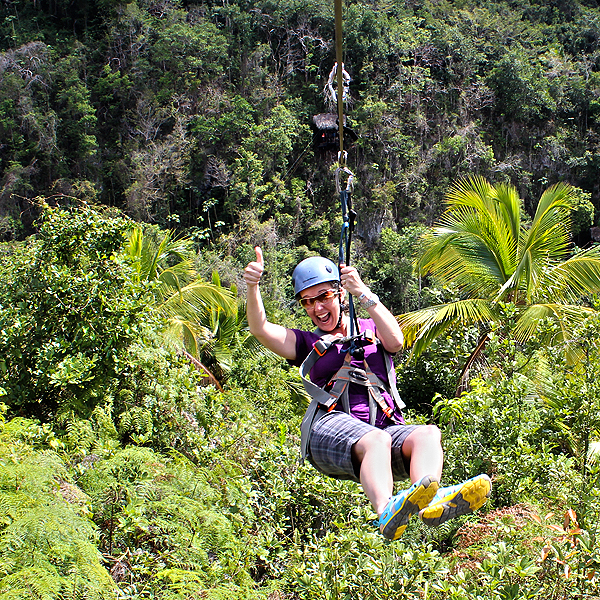 Samana Zip Line Tour is an eco tourist attraction for all ages. The tour began in the Safari trucks that picked us up at the hotel. There were 12 ziplines and at the end we got to play in the LuLu waterfall. After which, we then took a walk to a ECO Village that was being turned into a hotel. The guides were amazing. They made us laugh with their zipline antics, they educated us about the local area, and they put even the most nervous person in our group at ease. At the end of our day, we stopped at a local Dominican home, where we received the background about local foods. We tasted fruit, mamajuana and chocolate. Samana is a pretty quiet little town, so was great to get introduced to some fun as well as some local culture. Posted in ActivitiesTagged domincan republic, eco-tourist, Samana, ziplineBookmark the permalink.